As I told you in my earlier entries, I am a practitioner of the mystic arts. It enables me to embrace the darkness and deal with entities, real or imagined, that come to my attention. was promoted... A business man received this letter and threw it away. promoted and all his problems were solved within 13 days. to you so people. Get sending!! :) don't be lazy. PS: Do not send back to the person who sends this to you!!!" The Shadow is posting this to let you know that if you receive this photo -- DO NOT FORWARD IT. It is a total hoax. The picture has been doctored. This email has been going around since late 2003 and it surprises me that it is still active. But it is playing on the fears of others. For more info on this hoax, you can click here and here. One time when I was a little kid, I was positive I saw something very similar to this ghost come out from under my bed. I am too frightened by the photo NOT to send it along. I bet I don't sleep at all tonight. The Shadow can identify with this. But The Shadow also knows that this is not a real ghost and you should sleep fine. Just do not forward the email. Shadow, how would I know a real ghost? Or a photo of a real ghost? You are right, I will not forward the email, but how will I know in the future? 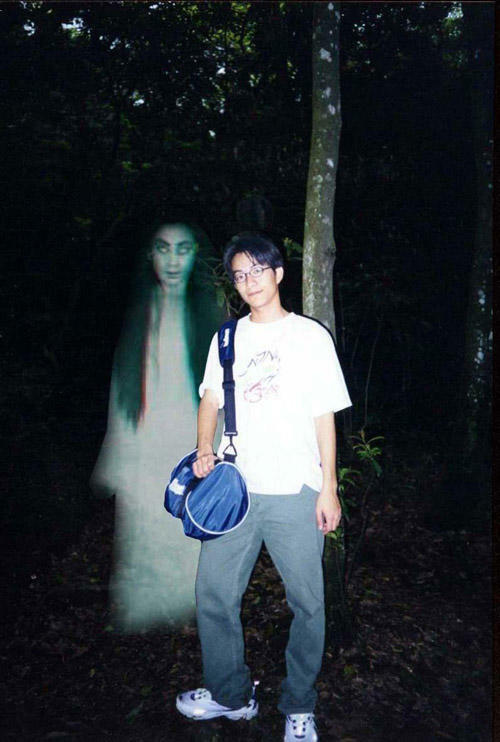 The mystical arts can help one determine if a ghost or photo of a ghost is real, usually through an observation of the aural spectrum or by using techniques such as hypno-transcendancy. The Shadow has other methods available to him to determine the authenticity of a ghost. The ghost in this picture is not real. I am not familiar with other methods of determining if a ghost is real or not, Shadow. What other methods have you had success with? Because of the nature of who I am, that cannot be revealed. The Shadow is a man of darkness and as such, I must use the dark side to determine these things.